With a low debt-ratio to start with and interest rates at rock bottom levels, this is the time to invest and grow. That will help lift the economy and create jobs. And that's what Canada needs now more than ever. The Harper/Mulcair fixation on a short-term balanced budget -- at the expense of growth and everything else -- is the wrong priority. According to Thomas Mulcair, last week was supposed to be when the NDP would nail down the fiscal framework around their campaign platform. It turned into a train wreck -- three big things went wrong. First, their numbers don't account for everything they've promised. Big things like infrastructure, transit, child care, healthcare, indigenous peoples, foreign aid and more have either been watered-down, back-end loaded or dropped altogether. Secondly, the NDP have based all their calculations on the same bogus economic assumptions that Stephen Harper used in his April budget, including a totally unrealistic economic growth projection which has been thoroughly discredited by the Bank of Canada, the Organization for Economic Cooperation and Development, and many others. Yesterday, former parliamentary budget officer Kevin Page said the NDP's financial analysis is "Swiss cheese fiscal costing ... not very prudent or transparent" and based on Mr. Harper's budget numbers which are simply "not credible". And former deputy finance minister Scott Clark said NDP arithmetic is "all fantasy ... fudging the books ... it doesn't balance." 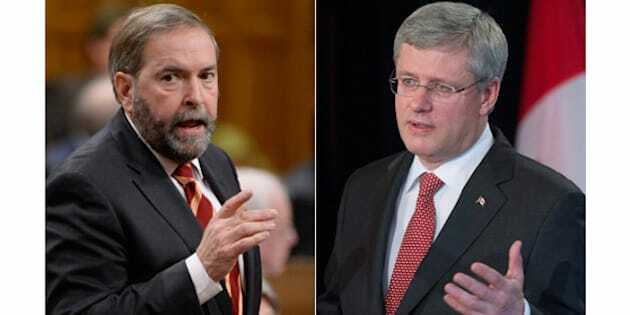 The third problem -- and probably the most serious -- is that Mr. Mulcair has agreed with Stephen Harper that immediately balancing the federal books is the most urgent thing the Government of Canada needs to do. It must trump everything else -- right now. Mr. Page and Mr. Clark, together with former Bank of Canada Governor David Dodge, former Privy Council Clerk Kevin Lynch, Canada's former chief statistician Munir Sheikh, and many others, all say a modest surplus or deficit -- either way right now -- is inconsequential. What's needed urgently more than anything else, they say, is sustained and sustainable economic growth to generate jobs, confidence, momentum and expanding prosperity. For most of Mr. Harper's decade in office, the Canadian economy has sputtered. We've suffered two recessions. Mr. Harper didn't get us fully out of the first one before he fell into the second one. He has the worst growth record of any prime minister since R.B. Bennett in the 1930s. And what are the consequences of too little economic growth? There are 160,000 more jobless Canadians today than just before Mr. Harper took power. Job quality is at a 25-year low. Household debt is at a record high. Families are struggling with the high cost of raising children or post-secondary education. Most haven't saved nearly enough for a secure retirement. A lot of empty-nester households have found their adult children have moved back home because they just can't get a decent start on their own. A majority of Canadians worry that their kids will not be able to do as well as they did. Expectations of progress from one generation to the next are deflating. All this is what results from a slow and stagnant economy? So what is the solution? Mr. Harper says just keep cutting everything in sight to balance the books quickly. Mr. Mulcair has exactly the same priority. But that approach has failed miserably for most of the past decade. Canada desperately needs a new plan -- to invest in the drivers of growth and jobs, like community infrastructure, education and skills, innovation, and the spending power of the middle class and all those working hard to get there. This is Justin Trudeau's plan. With complete transparency, Mr. Trudeau says his investment plan will result in three years of modest, manageable deficits, but the books will be balanced in 2019, and in the meantime, Canada will have a steadily dropping debt-ratio (meaning we'll remain fully fiscally responsible). With a low debt-ratio to start with and interest rates at rock bottom levels, this is the time to invest and grow. That will help lift the economy and create jobs. And that's what Canada needs now more than ever. The Harper/Mulcair fixation on a short-term balanced budget -- at the expense of growth and everything else -- is the wrong priority.